Tommy Hilfiger’s lifelong passion for music and its most famed performers inspire him to create a fragrance that represents the energy, talent, and beauty of an icon, while at the same time offers a glimpse of a rare, private moment of a celebrated superstar. The result: a spectacular fragrance that captures the alluring play of confidence and modesty, and the brilliance and privacy of the gleaming radiance of an American superstar – up close and in the flesh. 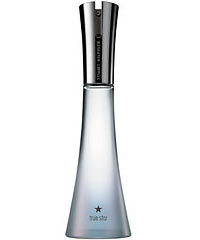 Notes for True Star include Illuminating Brightness Accord, Bright Watery Notes, Fluid Floral Accord, Sweet Pea, Syringa, Honeysuckle, Caressing Comfort Accord, Creamy Rice Pudding, Kashi Cereal, Toasted Wheat Grains.